At least three households have been kicked out of RDP houses in Du Noon by the South Africa Civic Organisation (Sanco) over the last week, allegedly because they were “illegal occupants”. And the Du Noon Sanco branch say they are “clamping down”. Sanco branch co-coordinator Chedreck Makeleni said the civic organisation was clamping down on people illegally occupying RDP houses in the area. On Tuesday Makeleni said over the past week three people who illegally occupied RDP houses have been forced to move out. On Sunday, it was the turn of Pretoria Henkelman, 55, her children aged 32 and 23, and their four grandchildren. Two backyarders were also forced to move off the property. Makeleni said Sanco had a supporting document obtained from the city housing directorate showing who the “true beneficiaries” of RDP houses were. “We have removed three illegal occupants of RDP houses last week alone. It’s ongoing. Some occupants are resisting but they will eventually be forced to move out,” said Makeleni. He said they held public meetings frequently and warned people who were occupying RDP houses illegally to surrender the houses to the right owners. Although some people had sunk thousands of rands into improving the RDP houses they occupied, that was not Sanco’s concern, he said. On Sunday Pretoria Henkelman and her family were forced out by almost 100 residents led by Sanco members. Chanting and singing that they were ‘taking action by force’, the group marched to the house Henkelman rented and demanded she and her family vacate. Two other people living in the backyard of the property were also forced to vacate their backyard shacks. Appearing stressed and confused, Henkelman, who is open about her HIV+ status, struggled to move belongings such as a fridge, beds, kitchen utensils and cupboards to the backyard of her cousin’s RDP house. She said Sanco members had thrice threatened to forcibly remove her from the house, the first time being in September last year. She said the official beneficiary of the house died in 1999 and she rented it from his “girlfriend”, Nomhle Mayisela, 54. She said when she was told to move out from the house in September last year she went to see housing officials in the City’s Blaauwberg region who advised her not to move as they were going to investigate who was entitled to the house after the official beneficiary passed away. She said City officials also instructed her to stop paying rent to Mayisela “until they find the real next of kin”. 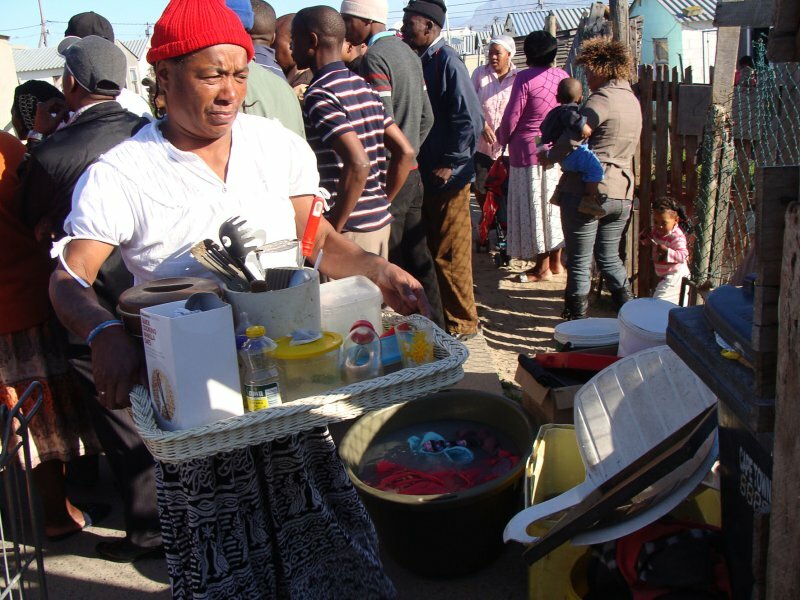 Mayisela, 54, who stays with her brother in an RDP house in the same road, said she wanted to move in her RDP house as Henkelman was not paying rent and it appeared as if she wanted to claim ownership. Mayisela said Henkelman hadn’t paid rent for two years. Western Cape Housing MEC Bonginkosi Madikizela said they were not aware of Sanco’s actions in Du Noon. Madikizela said he did not know what criteria the Du Noon Sanco leadership used to determine who was a legal and illegal occupant. He said so far no one had complained about the matter to the housing department. Surely this is against prevention of eviction legislation and those doing the evictions should thus be subject to arrest? Shouldn’t the police be preventing this? I want to commend SANCO Du Noon branch for such a bold action. This illegal occupation of RDP houses, in some instances with the assistance of municipal officials, is a country wide problem and it must be stopped. Not so long ago etv’s 3rd degree also exposed this kind of corruption. What one finds strange, is that such expose seems not to be appreciated by the authorities, though you always hear them shouting so loudly about up-rooting corruption. I am also aware of the Robertson Sanco branch investigating similar allegations. Qina!! Mhlali Qina !! Secretary-General: SANCO Boland Region.